← It’s Ugly Sweater Time! 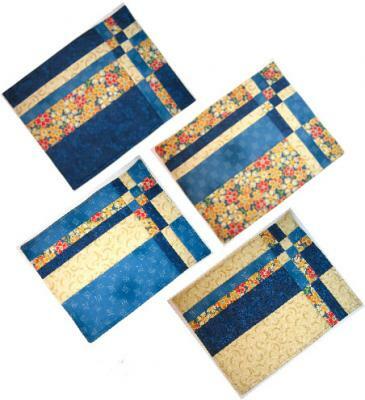 What types of patterns sell the best here at QuiltWoman.com? There are two ways to answer this question: What always sells well, and what is selling well right now in 2017. Keep in mind that these are VERY GENERAL suggestions and there are always exceptions to the rule. If you have something that your friends think is great, go for it! Patterns with a huge WOW factor – at any skill level – many people buy patterns above their skill level in hopes that they will one day get there or have someone else make it for them. The WOW can come from the design or the color arrangement. Patterns that look complex but are simple to make – the best example I have of this is our top selling pattern that sells well year after year – Take Four Placemat. Which also falls into the next category – Small Simple projects. These always make great gifts. They also give great satisfaction because you can whip up a small project and feel accomplished between those big projects that might take you years to finish. Even those of us with advanced skills love to make simple projects. Very simple appliqué – the cuter the better. Patterns that can use many styles and types of fabrics that are readily available or scraps out of your stash. Patterns that show a new technique or a new easier way to accomplish an old technique. Patterns that use new gadgets and notions that are popular. Any fad motif such as Owls which have been very popular lately – I think it is still a good idea to jump on and ride these waves but know when to move on and don’t expect ongoing sales for years. Bright colors are very popular as well as black backgrounds. These contribute to that WOW factor. Animals – especially wild and jungle animals. One nice thing about this is that they appeal to boys and men. We never seem to have enough patterns for them. What does not usually sell very well: Anything with a limited market. This means it will appeal to a limited audience or for a limited time. I’m not saying you shouldn’t design them, just keep in mind that many of these may sell very well when they first come out and then not so much over the long haul. Geared toward one sector of the population such as one state, one age group, etc. Patterns that have already been done to death – one more pattern with traditional star blocks is not really where you want to spend your time. One thing that many of our designers do is what we here at QuiltWoman.com call a “face lift”. This is where they take a pattern that they published years ago and put new fabrics in the cover photo project. This can be done by actually making the quilt or by a virtual computerized image. We will talk about images in a later post. Keep this in mind as you are creating your patterns and you will be able to leverage your work for years to come. HUGE HINT: WRITE YOUR PATTERN SO THAT THE COVER PHOTO CAN BE CHANGED WITHOUT HAVING TO CHANGE THE INSTRUCTIONS MUCH OR AT ALL. To do this, use Fabric A, Fabric B, etc. instead of Blue, Red, Purple. Use a color chart with references to the fabric letters and then label your diagrams with those letters. The main thing I can say to you is that if you want to have a serious business, design for the market, not just for your own tastes. 2 Responses to Produce YOUR Own Patterns! What good, useful, down-to-earth advice! Thank you. Those of us who hear “why don’t you publish that?” from our quilting friends may indeed have a potentially publishable (?) pattern. I look forward to the upcoming posts and their topics.